The ULTIMA MOS-5 Intelligent Sensor is a micro - processor-based transmitter designed for use with MSA's Metal Oxide Semiconductor (MOS) sensor. This unit features one person calibration and can virtually self-calibrate through activation of a magnetic switch and the application of gas. It is designed to detect hydrogen sulfide in parts per million (ppm) levels and provide status indication and alarm outputs. All of the ULTIMA MOS-5 Detector electronics are contained within an explosion-proof housing so that sensor information can be processed at the sensor site. It provides a 4-20 mA signal which is propor - tional to 0 to 100% of the detection range at the sensor. In addition, the ULTIMA MOS-5 Detector includes warning, alarm and fault relay contacts that can be used to indicate an alarm or fault condition, and dual redundant ModBus or HART communi - cations. Configurations with relays, ModBus and HART are available to meet many needs. The ULTIMA MOS-5 Detector includes a three (3) digit LED display. This local digital display continuously indicates gas concentrations during normal opera - tion and in the calibration check mode, calibration prompts during calibration mode, display codes during the setup mode and eight fault codes. The ULTIMA MOS-5 Detector has four different operating modes. The first is the normal operating mode in which alarms are active and the display and 4-20 mA readings are proportional to the gas concen tration at the sensor. In the second mode, gas check mode, the user can apply a gas and check the sensor response while alarm outputs are inhibited. 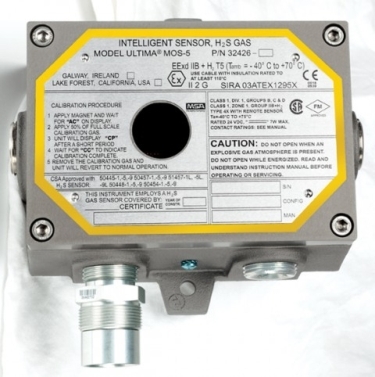 The third mode, calibration mode, enables gas to be applied to the sensor to calibrate the unit. Finally, a set-up mode allows the user to review or change setup options such as relay settings, sensor range, and ModBus parameters. Selecting Setup Mode on the ULTIMA MOS-5 Detector is accomplished by using the magnetic switch, HART or ModBus command.